Four policeman injured by Arab rioters who threw stones, wooden planks, cement blocks and firebombs on Israel Police during Tisha B'Av. Jerusalem police clashed Sunday morning with a group of Arab youths, some of them masked, who barricaded themselves overnight inside the Al Aqsa Mosque on the Temple Mount. The youths collected stones, wooden boards and planks, and fireworks to make firebombs in preparations for a riot with Israel Police as well as to disrupt those visiting the Temple Mount for Tisha B'Av, the fast marking the Temple's destruction. They used shoe racks, steel bars, and ropes to block doors to the Al Aqsa Mosque from being closed - also in preparation for a violent confrontation with police officers. 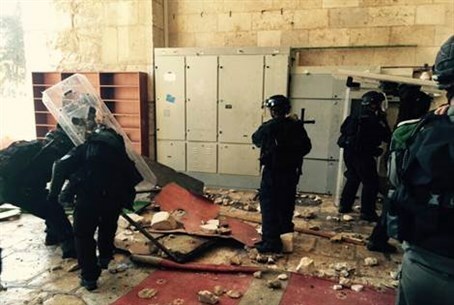 As Police and Border Patrol forces, under the command of Jerusalem District Commander Moshe Edri, entered the Temple Mount compound, masked rioters fled into mosque, from where they threw dozens of rocks and cements blocks at the police. They also shot fireworks and sprayed the security forces with an unidentified fluid, lightly injuring four of the policeman. Despite the escalating violence, police managed to prevent further injuries by closing the doors of the mosque, with the rioters trapped inside, and restoring quiet to the Temple Mount, allowing visitors to enter. "The police forces acted with skill and professionalism, showing determination and courage under a shower of rocks, fireworks and iron bars. As they began to remove the barriers placed at the entrance to the mosque, masked men continued to shoot fireworks at police, injuring several of them," Israel Police said in a statement. "In light of the severe confrontation and the escalating actions of the rioters and with the aim of preventing further injury to police... forces entered a number of meters inside and closed the doors to the mosque with the rioters inside, restoring order." Two of the injured policeman were evacuated to Hadassah Medical Center for medical treatment while the others were treated by paramedics on the scene. Visits to the Temple Mount from both Jews and tourists on Sunday morning continued as normal. President Reuven Rivlin condemned the clashes at the site Sunday afternoon. “Today, the fast of Tisha B'Av, we mourn the destruction of the Temple, the memory and lessons of which stay with us each and every day," he said. “The acts of violence and terrorism committed especially today, against worshipers at holy sites, must be condemned unequivocally."